In a world that is not predictable, improvisation, evolution, and innovation are more than luxuries: they are necessities. The challenge of design is not a matter of getting rid of the emergent, but rather of including it and making it an opportunity for more creative and more adequate solutions to problems. 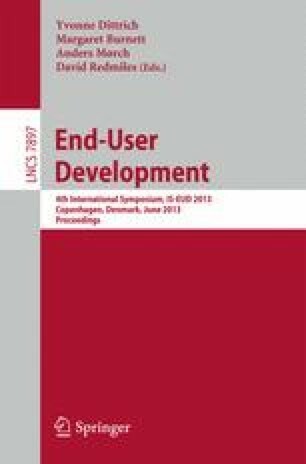 End-User Development (EUD) provides the enabling conditions for putting owners of problems in charge by defining the technical and social conditions for broad participation in design activities. It addresses the challenges of fostering new mindsets, new sources of creativity, and cultural changes to create foundations for innovative societies. Grounded in the analysis of previous research activities this paper explores (1) conceptual frameworks for EUD (including: socio-technical environments; meta-design; and cultures of participation), (2) models guiding and supporting EUD (including: the seeding, evolutionary growth, reseeding process model; and richer ecologies of participation). These frameworks and models are briefly illustrated in one specific application domain. The paper concludes by articulating new discourse concepts and design-tradeoffs to shape the future of EUD being understood as a cultural transformation rather than only as a technology in creating software artifacts.